Millions Don't Know the Real Jesus Christ of Nazareth - Do You? LET'S FACE this question! Is it rational to believe in God? Is God merely a myth — an invention of an ignorant, superstitious past? Many today assume this. With me — and I hope with the reader — I wanted to KNOW! I wanted to be SURE! I questioned the existence of God! Also I questioned the opposing doctrine of evolution. I did not seek to DISprove either. But I did research and carefully examine the evidences on both sides of this two-sided question. For this question is the very starting place for the acquisition of all knowledge. It is the FOUNDATION for UNDERSTANDING! In my in-depth research into this question, starting 56 years ago, I emptied my mind of prejudice. I sought the TRUTH, whether it was what I wanted to believe or not. There are the two possibilities of origins — special creation by a Creator God, and the theory of evolution. It has become intellectually fashionable to accept the evolutionary doctrine. It has won popular acceptance in science and higher education. Even many professing Christian denominations have accepted it, if only passively. Yet, though in the minority, there still remain scientists, educators, and fundamentalist religious groups, as well as those in Judaism, who cling to belief in the existence of God. Many of these, however, especially among the more or less religious individuals, have merely assumed the existence of God. Why? Simply because they were taught it from childhood. It has been believed in the circles in which they have lived or associated. But few of these have proved it! Of course, on the other hand, perhaps a vast majority who accept evolution, at least passively, were simply swept into that acceptance in college or university. It became the scholarly "IN" thing. The opposite belief, special creation, has not been widely taught. It has not been objectively examined. Too frequently, proponents utilize the psychological ploy that it is a badge of scholarly status to accept evolution, and a stamp of ignorance or intellectual inferiority to doubt the hypothesis. All of which goes to show that people in general believe what they do simply because they have been taught it, or because it has been accepted in their particular social environment. People want to belong! They go along with their particular group. In general, they believe what they have taken carelessly for granted — without examination or proof! Of course I know well, too, that people generally believe only what they are willing TO ACCEPT. In most instances people feel no compulsion to refuse what is accepted in their social or geographical environment. As one philosopher said, most dyed-in-the-wool evolutionists accept the theory because of their reluctance or unwillingness to believe in God. As the book professing to be the Word of God says: "The carnal mind is enmity [hostile] against God: for it is not subject to the law of God, neither indeed can be" (Romans 8:7). All the facts, positive evidence, rational reasonings and proofs in the world will never induce such a one to accept that against which he is prejudiced. For prejudice is a barrier to the entrance of truth into any mind. I was forced, on examination of the facts, to realize there is no proof for the theory of evolution. It is purely a theory — a belief — a faith, not based on proof. Though its zealous proponents push it onto the world as if it were proven fact! I found PROOF of the existence of the Creator God. I also found PROOF that the book called the Holy Bible is, in fact, the very inspired revelation from that all-intelligent, all-knowing God, of the vital, necessary, basic knowledge and instruction without which man is unable to solve his problems, prevent his evils, or live in PEACE, happiness, universal prosperity and abundant well-being here on earth. Man is the crowning product of his Maker. The Bible is our Maker's INSTRUCTION MANUAL He sent along with His product. An atheist wrote me: "We have the history of many religions, and many gods. Which one of these gods do you claim for your God — and how do you know that He exists?" That's a fair question. It deserves an answer! Yes, my friends, I have a God. The gods of some nations have been carved by men's hands out of wood, stone, or other existing material. The gods of some religions and individuals have been carved out of human imaginations and faulty human reasonings. Some have worshipped the sun or other inanimate objects of nature. All these gods are merely the created — most of them formed and fashioned by man, therefore inferior to man. But He who did the creating — He who brought everything that exists into existence, including all else falsely called God — He who created all matter, force and energy, who created all natural laws and set them in motion, who created LIFE and endowed some of it with intelligence — He is GOD! He is superior to all else that is called "God." He, alone, is GOD. CREATION IS THE PROOF OF GOD! But during the past two centuries especially, there has developed among God-rejecting men in the Occidental world, the mental disease of theophobia. Two hundred years ago it appeared under the popular catch-phrases "deism" and "rationalism." Then it masqueraded itself under the appealing name "higher criticism." This pseudo-scholarship employed, as it advanced, such attractive titles as "progress," "development," and "evolution." It has appealed to the intellectual vanity of a world groping in spiritual darkness in an era of widespread diffusion of knowledge. The theory of evolution provided the atheist an explanation of a creation without a Creator. But this misguided "rationalism" failed utterly to account for the origins of things and of life; and today the more candid among geologists and biologists confess that they do not know how life could have evolved from inanimate matter, through the simple life forms, to the complex, interdependent species we see about us, finally to man. Lamarck's theory of "use and disuse," Darwin's "natural selection" and other theories have now fallen by the wayside, and the "mutations" theory explains only the occurrence of varieties less fit to survive. Now suppose we confine ourselves to facts! What, then, has science actually determined? Discovery and study of radioactivity during the past century has proved that there has been no past eternity of matter! Radioactivity is described as a process of disintegration. The atomic age is opening up new fields to explore. Soon after Madame Curie discovered the element radium, in 1898, it was discovered that radium, and the other radioactive elements as we know now, are continually giving off radiations. Uranium is a radioactive element heavier than radium. It has an atomic weight of 238.5. In decomposing, it gives off a helium atom, weight 4, repeated three times, and then the substance left is radium, atomic weight about 226.4. Radium, then, is simply the end product of uranium after it has lost three helium atoms. Then the disintegration continues in radium. And the final product of this process of radioactive disintegration is the element lead! Now of course this process requires great periods of time. The calculated half-life of radium is 1590 years — uranium much longer. I have seen it myself, in the darkroom of an X-ray laboratory. A tiny portion of radium was placed on a mirror at the far end of a hollow tube, and I looked into this tube through a magnifying glass at the other end. Under this magnification what I saw appeared as a large, vast, dark sky, with thousands of shooting stars falling toward me from all directions. Actually what I saw were the emanations of tiny particles being emitted by the radium, greatly magnified. We know, therefore, that there has been no past eternity of matter! The radioactive elements in existence today have not yet been in existence long enough to have run their course, and disintegrated into lead. To have ALWAYS existed, without any definite time of starting in the past, this "life" period of radioactive elements long ago would have run its course. All radioactive elements would have long ago disintegrated into lead. Since these elements exist only for a definite span of years, and all the uranium, radium, thorium and other radioactive elements in the world today have not yet existed that many years, there was a time, prior to the duration of this span in the past, when these elements DID NOT EXIST! Here we have definite scientific proof that MATTER HAS NOT ALWAYS EXISTED. Here we have definite specific elements which once, in the long ago, did not yet exist. Then there came a time, later, when these elements CAME INTO EXISTENCE. Evolution usually postulates that things come about GRADUALLY, through the slow-moving natural processes of the present. Try to imagine, if you can, something coming into existence out of nothing, GRADUALLY! Can your mind entertain the idea? I think not. No, I think if you are rational, you will have to accept the fact of a special and necessarily instantaneous CREATION. And SOME POWER or SOME ONE had of necessity to do the creating. There is a cause for every effect. And in accepting that inevitable FACT, proved by the findings of science, of the existence of that GREAT FIRST CAUSE, you have accepted the FACT of the existence and preexistence of the Creator — GOD! But how about the presence of life? How did life get here? Science has learned some things about that, too. The wisest of the ancients did not know what science makes available today. Thus it is demonstrated today that LIFE COMES ONLY FROM LIFE, and that each kind reproduces only after its kind (Genesis 1:25). The works of Tyndall and Louis Pasteur, in the field of bacteria and protozoa, finally demonstrated scientifically once and for all in these more minute fields what Redi first demonstrated with larger organisms. All the advances of medical and surgical science in the treatment and prevention of germ diseases are based upon this great truth of the law of biogenesis — that LIFE can come only from preexisting LIFE. No fact of science stands more conclusively proved today. Life CANNOT come from dead matter. There is not one shred of truth from science to account for the presence of life upon the earth by any means other than a special creation by the great original first Cause — God — who is life and the fountain source of all life! It is now absolutely certain, according to all that can be KNOWN from science — according to all that is rational — that it required A REAL CREATION to produce life from the not-living — organic from inorganic matter. One cannot rationally deny the existence of my GOD, unless he can account for the origin of LIFE without a Creator who, Himself, is Life! The Creator, therefore, begins to be revealed, by science and by reason, as a LIVING God — a God in whom is LIFE, and who alone has imparted life to all that have it! I could go further, and show you that what science has discovered about energy and its origin and the laws of conservation of energy, also proves conclusively that "the works were finished from the foundation of the world" (Hebrews 4:3), that the material creation is a completed work, which is not now going on! Next, then, let's examine whether the great FIRST CAUSE is a Being of intelligence, or merely some blind, dumb, unintelligent FORCE. Is Anything Superior to Your Mind? Look about you. You admit that the transmission of knowledge to your mind is limited to the channels of your five senses. So now I ask you, do you know of anything that is superior to your mind? Look at the planets coursing through the sky. Behold, in all its splendor, the entire cosmic universe, with its suns, its nebulae and galaxies. Yes, they are inanimate. They have no mind, no intelligence. They cannot do what you can do — think, reason, plan and carry out plans according to private volition and will. The human mind can know, think, reason, plan and carry out its plans to execution. It can invent and produce instruments by which it may acquire knowledge of the vast universe, or of the minutest particle. By developing rockets and computers, man is able to send astronauts to the moon and bring them back alive. He can cause rivers to run backward, turn the forces of nature to serving human needs. And now he has learned how to release the energy of the atom, and utilize a power so vast that man is able at last to annihilate all life from the earth. But there remains one thing no man ever has been able to do. He cannot build, make, produce, or create anything that is superior to himself! A man can take existing materials and out of them build a house. An automobile is almost a living thing, but the intelligence and powers required to invent and produce it are superior to the thing produced. To suggest to you that anything you could invent, make, build, or bring into being could be superior in intelligence and ability to you and your mind, would certainly insult your intelligence! Now let me ask you candidly, do you honestly believe that any power or force of less intelligence than your mind produced you? If you do not believe in my God, then you have only the alternative of believing that something less than your intelligence produced YOU — that dumb, purposeless UNINTELLIGENCE brought into being your intelligence! The only rational possibility is to acknowledge that the very presence of the human mind is PROOF that the great First Cause is also the SUPREME INTELLIGENCE, infinitely superior to the abilities of mortal man! Suppose that you could add to your powers of reasoning, planning, designing, the actual CREATIVE power, so that you could project your will anywhere to produce and bring into being whatever your mind should plan and desire. Then, suppose you undertook the designing, creating, fashioning, shaping and setting in motion a limitless cosmic universe — with planets and suns and nebulae and galaxies in all their splendor, each of these vast units being of such intricate and complex construction as the existing universe. On one of these planets you would plan and produce all the forms of life that exist on this planet — and I do not mean reproduce, for there would be no present universe to copy. There would be worlds within a world, down to the minutest infinitesimal particles of matter we cannot even see by the aid of the most powerful microscopes. Do you think your mind would be equal to the task? Is it rational, then, to believe that any power or force lacking even human intelligence, could have planned, designed, created, formed, fashioned, shaped, put together and set in motion the awesome universe we behold? The First Great Cause who created matter, then, stands revealed as the SUPREME INTELLIGENCE and ARCHITECT OF THE UNIVERSE! But again I say, look about you! Here are human beings on this earth, composed mainly of certain, specific elements of matter — living, organic matter. These elements of life must be supplied and replenished through food, water and air. No man, with all his ingenuity and science and laboratory facilities, CAN PRODUCE FOOD! That is, he cannot take plain inorganic matter and turn it into the living substance we call food. But some Power, Force, Intelligence, or Being did in some way, at some time, start the process going — a process far too wonderful for any man to devise or produce. And so it is that out of the ground grows grass, and green leafy vegetables, and all other vegetables, and vines and trees yielding fruit — each with its seed in itself, each through this seed reproducing after its kind — and it is very good! But when a marvelous little grain of wheat is planted in the ground, a plant develops and sprouts above the ground, and in some manner too wonderful for any human mind to understand or imitate, the elements drunk in through the roots from the ground are utilized by the life germ in the seed of wheat, and new grains of wheat appear. During this process, the inorganic iron and other elements dissolved in the ground, drunk into the roots and carried up into the new grain of wheat, have been actually converted into organic matter which can be assimilated as food. And this same marvelous process takes place in the growth out of the ground of all grains, vegetables, fruits and foods. When we eat animal meat we are merely consuming, secondhand, the vegetation which the animal ate. MAN, with all his vaunted science, his technical laboratory facilities, with all his inventive genius, lacks the intelligence and the powers to produce a grain of wheat, or to convert inorganic matter into living food. Then is it rational to say that forces or powers exist, of NO intelligence, which have been able to produce this living miracle of food? Did not a far GREATER intelligence than man design, create, and supply man with all of this? But now let's COMPARE the wisdom and intelligence of man with that of God who brought these marvels into being, and keeps them functioning. The grain of wheat GOD causes to grow out of the ground is a perfect food. But, like other perfect gifts from God, man fails to value the priceless perfection of the all-wise God, and, undertaking to improve on God's handiwork, perverts, pollutes, and defiles it! Every bit of God's perfection man's hand has ever touched, it would seem, he has besmirched, spoiled and polluted! And the poor, defenseless grain of wheat is no exception! Into flour mills of human devising go the millions of bushels of healthful wheat. Yes, the sugar refiners do the same thing to sugar; and nearly all foods on the market for human consumption today have gone through man's factories and suffered from man's processes until they have been devitalized, depleted of their health-giving properties and turned from foods into slow-acting poisons! And these foodless foods with which man has tampered in lust for profits have produced in human bodies a whole series of diseases of which our forefathers of a few generations ago never heard! Result: Today human beings drop dead before their time with heart failure, others die with cancer; the population suffers rheumatism, arthritis, diabetes, kidney diseases, anemia, colds, fevers, pneumonia and thousands of other diseases. We respond to the toothbrush and toothpaste ads and frantically brush our teeth, but our teeth keep decaying and we lose them beginning at an early age because of lack of calcium and fluorine in our diet. Whose intelligence is higher — that of the GOD who provided every perfect need for every living thing, or that of greedy, gullible, God-rejecting humans who, in the interest of bigger profits and more luxuries for themselves, have ROBBED the very foods God created and gave us, of their health and body-building values? I needed an accurate watch with a very plain dial for timing broadcasts. The only kind that filled the need was a railroad watch. I have one — the very finest railroad watch made, a 23-jewel watch. But it does not keep perfect time. Once or twice a week I have to adjust it a second or two, if I want to be sure it is accurate to the second. I set it by the master clock of my city (or any U.S. city), which is always found at the Western Union office. But even this clock does not keep perfect time. Once or twice a week it must be adjusted by a second or two to the master clock of the nation, by telegraph, from the Naval Observatory, Washington, D.C. There at the Naval Observatory is the master clock of the U.S.A. But this great master clock of the United States is not perfect, either. It, too, must be adjusted and corrected occasionally. Yes, it is corrected by the MASTER CLOCK OF THE UNIVERSE — UP in the skies — by astronomers! Up there in the heavens is the great master clock that NEVER makes a mistake — is always ON TIME — never off a fraction of a second — the heavenly bodies coursing through the skies! Now you, sir — my doubting friend! If I show you my fine precision 23 jewel railroad watch and tell you that it was not made in a factory after all — in fact, it was not designed, planned, put together, by any watchmaker at all — that it just sort of HAPPENED — that the iron ores just brought themselves up out of the ground, refined themselves, formed and shaped themselves into the delicate little cogs and wheels and other pieces; the silicon just came of its own accord out of the earth and turned itself into the glass crystal; the gold case just refined itself, shaped itself; the cogs and wheels and scores of little parts just assembled themselves together in that case, wound themselves up, and started themselves running and keeping almost perfect time — well, if I should try to tell you anything like that, you'd tell me I'm crazy or a fool, would you not? Certainly! You know that the presence of that watch is RATIONAL AND POSITIVE PROOF of the existence of a watchmaker, or watchmakers, who thought it all out, planned it, formed it, shaped it, put it together and started it running. But then you, Mr. Skeptic — you look up into the great vast sky at the MASTER CLOCK of the universe, which never misses a second — the perfect watch by which we must constantly set all our imperfect man-made watches — and you tell me, "That all just HAPPENED! There was no Great Watchmaker! No Master MIND thought out and planned that vast universe, brought it into being, set each star and planet in its own exact place, and started the myriad heavenly bodies coursing through space, each in its prescribed orbit, in its orderly precision. No, it just fashioned itself, put itself together, wound itself up, and started itself running. There was no Intelligence — no planning — NO CREATION — NO GOD! Do you say that to me? If you can look about you, and observe how intelligently PLANNED and executed is everything in nature and in plant and animal life — everything we see except the bungling, botching, polluting of God's beautiful handiwork by the clumsy hand of God-ignoring-and-rejecting MAN — and then say you doubt the existence of an all-wise, all-knowing, all-powerful Creator GOD, then I do not have much faith either in your rational processes or your sincerity as a seeker of the Truth! This is the most vital decade of all history! 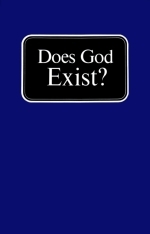 Never has it been more urgently necessary to answer the question, "Does God exist?" Atheists and evolutionists assume He does not! Churchgoers, some Christians assume He does! It's time to quit assuming! It's time you saw the proof! THERE IS A delusion gripping the minds of more people today than Communism. It holds them in its sway, deluding and deceiving them, making them veritable slaves. It is the concept of "no God." Sir Julian Huxley, grandson of the famed evolutionist, has stated: "There is no longer either need or room for supernatural beings capable of affecting the course of events in the evolutionary pattern of thought. The earth was not created, it evolved. So did all the animals and plants that inhabit it, including our human selves, mind and soul as well as brain and body." Is there "no longer any need for a concept of God"? Is the Bible merely a collection of Hebrew fables, or the dynamic living Word of an intelligent, all-wise Creator Being? These questions demand an answer. Your very life, the lives of your loved ones, and the future of this world hang in the balance. Need "Christians" be afraid or apprehensive of science textbooks? Is the Bible totally out of harmony with all science? Do modern-day discoveries in the sciences render the Christian helpless to reconcile his belief with the "enlightened age" in which he lives? "Our own galaxy, which we remember is but a tiny part of the universe, has probably existed a million, million years. "But some progress has been made in attempting to explain how and when the sun and its nine planets came into being. The study of the solar system gives us at least a clue to the origin of that part of the universe most important to us — the earth. "The explanation commonly accepted today is called the Hypothesis of Dynamic Encounter, formulated about 1900 by T. C. Chamberlain and F. R. Moulton of the University of Chicago. In brief it suggests that our solar system had its birth when the sun was approached by another huge star. The latter, through the operation of the law of gravitation, detached from the sun great masses of flaming gas. The orphan masses from the parent sun gradually cooled and crystallized to become the nuclei of planets. These continued to revolve around the sun, held in their orbits by the gravitational pull of the parent body. "The evolution of the earth to its present state was very gradual" (Wallbank and Taylor, Civilization Past and Present, Vol. I, page 31). Even though it is outdated in certain respects, I quote this statement in full for a very special reason. Let's go back and carefully ANALYZE what we have just read. Notice carefully the italicized words in the quotation you have just read. We have such words in the opening phrases as "probably, some progress has been made, attempting to explain, at least a clue, explanation commonly accepted, Hypothesis, and it suggests." What a collection! Here are numerous "attempts" to explain, "some progress" being made, at least a "clue," and the "suggestion" of a "hypothesis" — the very word itself meaning "we guess." Then, in very careful wording, having begun with a number of "possibles" and "perhapses" the book begins to tell of definite past occurrences which are said to have taken place. But let's analyze further. Let's get to the very trunk of the tree of this very vital first proof of the existence of God. In the very beginning the writers, even though beginning with many attempts to explain, clues and guesses, admit the existence of our solar system, a "sun," another "huge star," the "operation of the law of gravitation," great "masses of flaming gas," and admit that these gases "gradually cooled." They also mention how these gases "crystallized" and then continued to "revolve around the sun, held in their orbits by the gravitational pull of the parent body." What a fantastic array! Here is a tremendous, limitless, imagination-defying expanse — an entire universe. Here is a whole solar system, a huge sun, the operation of certain, definite, immutable, unchangeable LAWS. Here is a supposed collision between gigantic, breathtakingly huge astral bodies, resulting in the supposed formation of our present solar system. Think of it! All of these myriad laws — of heat, light, energy, motion, the rotation of astral bodies, the laws of gravity, the principle of isostasy, which demands that every orbital body must gradually assume and maintain a near-round shape, and myriad other laws, entirely too numerous to mention — are admitted to exist. Get back to the real TRUNK of the tree. Where is the place to begin? Is it an attempt to explain the existence of our present solar system? Decidedly not. Scientists and astronomers tell us that our solar system is only one of many such systems in our great galaxy called the "Milky Way." However, even our galaxy is only one of myriad galaxies, which form only a part of the vast, limitless expanse of the universe. Our planet, astronomers assure us, is merely a third-rate planet in a second-rate solar system, lost in the expanses of seemingly limitless space. Do you begin to comprehend? By what law did one star approach another? By what law did heat gradually cool? By what law was there a "gravitational pull"? By what law was there the existence of the "operation of the law of gravitation"? Yes, there it is. In dissecting and looking carefully into the statements of some of the preposterous hypotheses which have been advanced, you begin to see that in every case the writers have begun with an orderly, law-abiding universe, governed by irrefutable laws. Did Matter, Force, Energy, Laws, Evolve? Evolution purports to explain how the earth came to be — how MAN came to be. It is the atheists' attempt to explain the question of ORIGINS without a Creator — without intelligence! But where do they start? NOT with any explanation of how MATTER came to be — without a Creator! NOT with any explanation of how LAWS came to be — or what CAUSES them to work. NOT with any explanation for how matter, force, energy, such laws as gravity and inertia developed WITHOUT A CREATOR. In any explanation of the question of ORIGINS, one must explain the ORIGINS of matter, force, energy, gravity, inertia and the other laws, as well as the origin of LIFE. But evolutionists start with all these ALREADY CREATED AND IN EXISTENCE. Therefore the evolutionists, in fact, ACKNOWLEDGE CREATION before their explanations actually begin! They are thus forced to acknowledge the pre-existence of the CREATOR — for they begin their theories and explanations with THESE WORKS OF HIS CREATION already having been CREATED! They begin with matter and LAWS already created and existing! The existence of law, unchangeable, immutable, irrevocable, unseen and yet active, absolutely demands the existence of a great lawgiver. "There is one lawgiver who is able to save and to destroy... " (James 4:12). Before seeing this next amazing, irrefutable proof, it is first necessary to state, in simple terms, the meaning of the word "evolution." Of course, there are many processes called "evolution." The process of development of music from simple to complex is, in a sense, an "evolutionary" process as is true in all technological inventions. This has perhaps led many to assume such a development is also true in organic, living material. "Evolution is the gradual development from the simple, unorganized condition of primal matter to the complex structure of the physical universe; and in like manner, from the beginning of organic life on the habitable planet, a gradual unfolding and branching out into all the various forms of beings which constitute the animal and plant kingdom" (Richard Swann Lull, Organic Evolution, page 6). Evolution theorizes from the beginning of organic life — already having LIFE with which to begin. It does not now show, nor has it ever shown, nor will it ever be able to show, how life itself first CAME into existence. The theory of evolution (the word "theory" means "we think") states simply that all life forms that we know today, including humankind, have gradually evolved from the most simple life forms to the complex, intricate, interdependent species we see about us today, each reproducing according to its own kind. Evolution postulates that life evolved in a "gradual process," by "resident forces" into the complexity of life we see about us today. And herein, at the very basic trunk of the tree of all evolutionary thought, lies one of the greatest proofs of God! Evolutionists, geneticists, biologists, scientists in any field whatsoever have never been able to demonstrate, nor to offer the slightest evidence that the not-living can make itself into the LIVING. It is true that certain laboratory experiments have taken place in which supposed "dead cells" are said to have been "revived" and brought back to life by the means of certain chemical compounds. In other experiments, scientists have diligently tried to produce organic type compounds called amino acids. This, however, is a far cry from "spontaneous generation." There is a broad, gaping, yawning chasm of separation between life and death. The great gap between the not-living and the living is so broad, so insurmountable, so unfathomable by man, that evolutionists can only "suppose" and guess, offering vague, ethereal, nebulous "theories" as to how life for the first time "might have" begun accidentally! And by resident forces excluding the existence of an all-intelligent Creator! However, on the other hand, there is an absolute, demonstrable law of science which comprises the second major proof of the existence of a life-giving God. That is the law of biogenesis! "Bio" means life! "Genesis" means beginning. This law, then, is a law concerning the beginning of life. This law, simply stated, is the absolute law that life comes only from life. That the not-living can never give rise to, give birth to or produce the living. There is perhaps no law known to science that can be any more firmly and easily demonstrated than the law of biogenesis. The very existence of life demands a life giver! God states dogmatically, "And the LORD [Eternal] God formed man of the dust of the ground, and breathed into his nostrils the breath of life; and man became a living soul" (Gen. 2:7). Almighty God, the Life Self-Existent, the One who has life, who is Life, who was before all things, imparted life to the first man and set within man, the animals, and all plants the cyclical character of life which enables them to reproduce according to certain set laws. God is the great life-giver! Many of these amazing proofs of the existence of an Almighty God "overlap." That is, each is, to a degree, interrelated with the other. The third major proof of God can be stated quite simply from the quotation you saw under Proof Number One. You will notice that evolutionists, in trying to substantiate their theory, always BEGIN with an orderly universe and the existence of matter. Notice the so-called Theory of Evolution BEGINS with matter, laws, and "simple" life. What is matter? Matter occupies space and has weight. It is not always necessarily seen, since certain gases, and even the air which you breathe, are also classified as "matter." Until recently, scientists talked of the law of the "conservation of matter." However, with the discoveries in nuclear physics, and following Madame Curie's experiments with radium, scientists have now found there is a certain amount of "disintegration" in matter. This deterioration of uranium is a scientific fact! Uranium (U238) gradually disintegrates through many intermediate stages into lead (Pb206). Uranium, as you may well know, is radioactive and gives off energy in the form of radiation. Gradually, over a period of seemingly limitless years, this radioactive material disintegrates into lead. There is no proof of any new uranium coming into existence today! Hence science has firmly established that there has been no past eternity of matter! Matter must have at some time come into existence. It had to have been, at some time, created. Creation, then, the very existence of things, absolutely demands and requires a Creator. That which is made requires a Maker. That which is produced requires a Producer. Therefore, the third great proof is that the creation requires a great Creator. The One who is quoted in the first person as being God said, "Let the earth bring forth the living creature after his kind, cattle, and creeping thing, and beast of the earth after his kind: and it was so. And God made the beast of the earth after his kind, and cattle after their kind, and every thing that creepeth upon the earth after his kind: and God saw that it was good" (Gen. 1:24-25). Scientists have attempted to show the evolutionary pattern by "comparative embryology," by a study of selective breeding, genetics, and various other aspects of biology. However, without taking the tremendous amount of space necessary to even faintly scratch the surface of such a broad subject, suffice it to say there is an absolute, irrefutable, immutable, unchangeable law, which absolutely prohibits a jump from one kind to another kind! There are hundreds of different varieties within the dog kind, and while there may be small, tiny dogs, such as the Mexican Chihuahua, and also huge dogs such as the St. Bernard or the Great Dane, they are still dogs! They are not cats, or horses, nor are they even beginning to show a gradual trend toward developing into another kind of animal. They are all of the same kind. Comparative embryology tries to point out that the beginning embryos of fish, polliwogs, and humans look very much alike. This is absolutely true. But while it proves absolutely nothing for the case of evolution, this does offer a STRONGER proof of the existence of God. Scientists are defied to attempt to make the embryo of a fish turn out to be a polliwog, a man, or anything other than a fish of the exact same kind of fish which laid the egg in the first place. Scientists have attempted to prove their evolutionary theories by "selective breeding" and studies in "mutations." These do not prove evolution! They prove, rather, the existence of absolute, unchangeable LAWS governing the reproduction of all animal and plant life, and that those laws function within certain limited bounds that cannot be transcended or broken. While we are able to breed and cultivate today new varieties within a great kind, they are still of the same KIND and not a totally new type of life. Any farmer who labors in his fields, raising corn, wheat or other crops, knows some of the basic proofs of selective breeding. Scientists working with guinea pigs or other animals in laboratories can arrange an absolute pattern of just how the genes and chromosomes are going to react in the interbreeding of certain animals according to their coloring and various characteristics. They are able to tell in advance just exactly what the offspring are going to look like. Again, this does not prove anything except demonstrate the existence of an all-wise, all-powerful God who made these laws, and who also sustains them. The fact God said let the earth bring forth "after his kind," and has been enforcing and sustaining that law ever since, is the fourth major proof of the existence of God. In attempting to array the skeletons of an orangutan, chimpanzee, ape, gorilla, and a man, evolutionists assure us there is a definite pattern showing all have come from one common ancestor. This is an absolute fallacy! And again, this merely serves to show another clear proof of God. It does not prove an evolutionary process, but it does prove, rather, if men were willing to look at the FACTS, similarity of DESIGN. It shows that the same "Architect" had the same general plan and design in mind. It shows functional similarity, NOT the evolution of one into the other. This absolutely proves, not only the existence of a Lawgiver, but that there is, alive, acting RIGHT NOW, a Great Sustainer, of all that is. These laws are upheld, sustained, KEPT in action. How? By the Sustainer, who is GOD! Look about you. You live in a complex, intricate and interdependent world. It is a world of great design. You have never seen an ugly sunset. You have never seen an ugly scene in the desert, in the mountains, at sea, or anywhere on the surface of this entire earth, unless it were a scene made ugly by man. All is in harmony. Life, as we know it, is entirely interdependent upon other forms of life. Nothing lives or dies to itself. The question to the evolutionists is: Which "evolved" first, the flower or the bee? Did the bee evolve slowly for thousands, millions or billions of years independent of the flowers and the pollens from growing things which are his life source? Did the flowers and the flowering trees all evolve slowly and gradually over a period of millions or billions of years independent of the little bee, upon whom they must rely for their very continuation of life? These are totally insurmountable, and unanswerable questions to the evolutionists! The old question, "Which came first, the chicken or the egg?" is a question which the evolutionist feels worthy only of disdain. Why? Simply because he cannot answer it. It is better, from his point of view, to merely scoff, make fun of and attempt to dismiss such a question when he cannot answer it. This total interdependency of all life forms — the tremendous design within this universe — shows a common Beginner, one main Architect, one great Designer with an overall framework of a plan of creation into which all life forms fit. Nothing lives or dies to itself. Each living thing, whether plant or animal, when it dies, supplies further life for other living things. Observe a forest. A tree grows, finally dies and falls, only to become part of the fallow forest floor, supplying life-giving elements for the young trees which it had sown in its lifetime. This great universe, and the complex intricate earth on which you live and draw breath, is a world of great design. It is a world of such complex and intricate design as to take the very breath in beginning to investigate even the minutest part. The cleavage properties of minerals, the wings of a bird or a fly, the beauty of a sunset, the facets of a quartz crystal, and above all, the marvelous, tremendous masterpiece of all design, the human body, all point out that for such intricate design, there had to be an eternal designer. Design in the universe proves the existence of a designer! If you are interested in more details about the design in nature, write for our free full-color booklets A Theory for the Birds, A Whale of a Tale, and Fishy Stories About Evolution. You will be fascinated with the full-color photographs and vital facts contained in these booklets. This sixth proof of the existence of an Almighty God is perhaps the most astounding of all. About one full third of your Bible is prophecy; and while most of that one third pertains to our present day, there are many, many prophecies which have already been fulfilled, and which are presently BEING fulfilled. God sent His prophets thousands of years ago to such major cities as Babylon, Ekron, Ashdod, Ashkelon and Sidon. These prophets — simple human beings who had been commissioned with a message — foretold the events which were to befall each of these ancient cities. And without fail, in every single instance, exactly at the time prescribed, all these things HAPPENED! The very fact that God is able to foretell the future, and bring it to pass, is a great proof of His existence! This last proof is perhaps the greatest proof of all to true Christians. It is the proof of answered prayer. However, since the skeptics, atheists and doubters probably have never prayed, and hence have never had prayers answered, they continue to DOUBT. Now take George Mueller's example. George Mueller is dead now, but he was a great man of FAITH. He founded five great orphanages and other charitable institutions in Bristol, England. He started out, as FAITH always does, with a very small work, without any financial backing, and absolutely no means of support, except to get down on his knees and send up a believing prayer to God. For nearly seventy years George Mueller continued that great work, and it grew into a tremendous institution until it housed thousands. Every dime for feeding, clothing, sheltering, and schooling those thousands of orphans came in only one way — as a result of believing prayer. Altogether he received more than a million four hundred thousand pounds — that was about seven million dollars — sent to him in answer to his prayers! Real answered prayer is NOT the mere working out of events as a result of "concentration." Many people today seem to assume prayer is merely an accomplishment as a result of "positive thinking" or a psychological adjustment. Real answered prayer is a direct, completely miraculous supernatural intervention from Almighty God! It is the result of being obedient to God's Laws, asking according to His will, and then believing in faith until the answer comes. These seven, irrefutable, unchallengeable PROOFS of the existence of Almighty God represent only the minutest beginning of the subject. They are, nevertheless, proofs. It's about time people quit assuming — it's about time they began to really PROVE all things. It's about time YOU said with Job, "For I know that my redeemer liveth, and that he shall stand at the latter day upon the earth" (Job 19:25). And, finally, to the hostile, prejudiced skeptic, who stubbornly REFUSES to believe what he does not want to believe, even on seeing PROOF — IF any such have read this far (which I doubt) — I say, as the Prophet Ezekiel records repeatedly, we are now in the very living generation that shall SEE the living Christ — the promised Messiah — returning to this earth in the full, supreme POWER and GLORY of the CREATOR GOD, and then THEY SHALL KNOW that He is the LIVING GOD! As He, Himself, is quoted as saying, "Thus will I magnify myself... and they shall KNOW that I am the ETERNAL" (Ezekiel 38:23).